The first theme we encounter is with the games main menu. It is in fact an instrumental version of the song Fires of War which later plays across the end credits. This time round the music takes a different approach with a more positive and uplifting undercurrent. The stygian darkness of Mordor has been swapped for a more stoical mood and opening theme features swelling staccato strings. The central melody does still feature the high overtone along with the violins that were present in the first game but it feels very different this time, with a more optimistic spin. 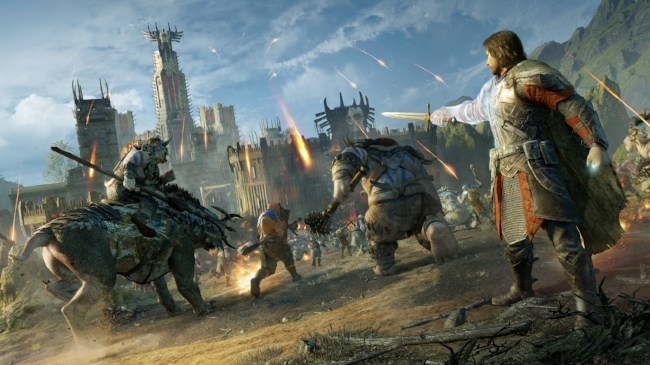 Talion is no longer seeking revenge but to over throw Sauron himself and this driving passion is reflected in the soundtrack. Once you start following the narrative of the central story and move beyond Minas Ithil, the soundtrack feels much closer to the tense and portentous ambience of the original title, with choral parts and low register piano interludes. There are not so many leitmotifs used this time round and the score is more of an evolving soundscape. This suits the game play far more appropriately. For the sake of continuity, many of the themes associated with Talion’s specific abilities are used again. This includes the magnificent Caragor Riding with its off-kilter beat, Cello and vocalisation of the Ring Lore. Overall Middle-earth: Shadow of War boasts a very accomplished soundtrack and a worthy successor to its predecessor.